Learning online is a great alternative to college. Anyone can learn how to draw, paint, or render CG artwork. And it certainly doesn’t take a 4-year degree to land a job in the entertainment industry. 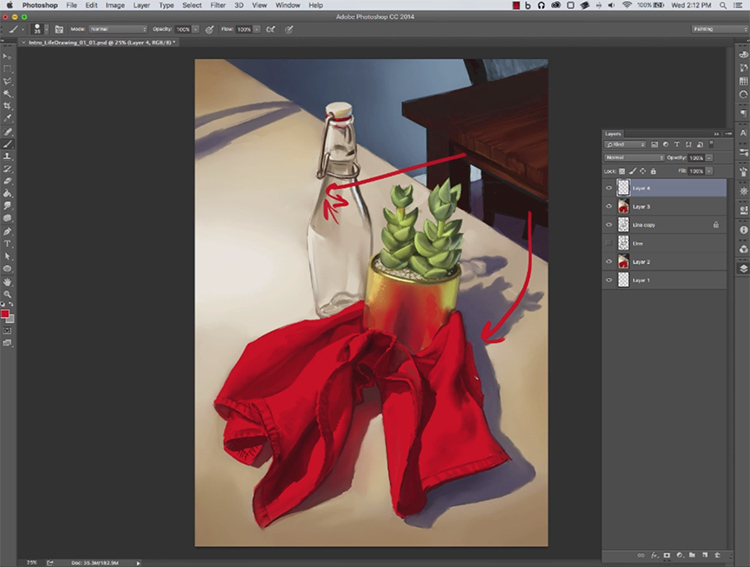 CG Spectrum is a learning resource with live online classroom-style lessons for artists. Rather than buying pre-filmed video courses you’re buying access to live classes & live critiques where you’ll study under mentors with real industry experience. These courses run for a set period of time and they come with homework, video critiques, and a community for chatting with other students. Because CG Spectrum runs lengthier courses and offers video critiques they do charge a good amount. But if you’re looking for a college-level learning experience without the college degree, CG Spectrum is a powerful choice. Not to mention you can take these courses anywhere from the comfort of your own home. With CG Spectrum you have two types of courses: smaller 4-month courses or much longer 12-month diploma programs. Note these diplomas are not the same as a college degree. However they do hold merit since the CG Spectrum brand is well known in the entertainment industry. Completing a diploma program won’t guarantee you a job but it’ll definitely look great on your resume. And really, the value is in the practical education not the title. Most of these courses assume some level of prior experience. But you don’t need to be an expert—in fact you’d be taking the course to become an expert. A newbie may be able to pick up an intro course and learn along the way, but the material will be tough. Likewise a more advanced artist may use these lessons as a stepping stone to learn more techniques & expand their network of artists. I think the ideal student is someone with a bit of experience in whatever subject they’re studying. These courses will radically improve upon foundational skills and prepare you for a career in the industry working as a modeler, character designer, 3D animator or anything else. Some background on CG Spectrum: they’re based in Australia and they’re located in The Arcade Melbourne. This is a coworking space shared with almost 30 other game studios all working alongside CG Spectrum. Many of these game studios come to the CG Spectrum staff whenever they’re looking for new junior designers & artists. But the field is crazy competitive, so you really have to stand out with a solid portfolio and make the right connections along the way. Ultimately with CG Spectrum you get what you put in. There isn’t too much hand holding but you can pay extra for one-on-one sessions with the teacher(called a “mentor” at CG Spectrum). This is super useful to get feedback on your work and to solve problems that you just cannot figure out alone. To learn more check out this intro video created by the CG Spectrum team. All of CG Spectrum’s courses(both the diplomas and one-off courses) are taught by industry professionals. This means you’re learning from pros who really know what they’re talking about. You’ll study the skills necessary to actually land a job in the field so it’s a very practical choice for anyone serious about entertainment art. Once you pay for a course you’ll get full access to all learning materials in the student dashboard. This includes a detailed onboarding process where you’ll learn how to use the dashboard interface, how to access course materials, and how to submit your projects for review. Plus you can setup chats with any of your classmates to introduce yourself and swap contact info to keep in touch after the course ends. In this industry, who you know is crucial. You never know who might land a job and come back to you if they know of an open position, so don’t look at CG Spectrum as just online learning. It’s an opportunity for making new friends and networking(ugly word but really necessary). With each week you’ll have a mix of instructional videos along with live class videos & live feedback/mentoring videos. You can ask for critiques on your own personal projects to learn from your mistakes and make direct improvements. All live videos are recorded and saved in your dashboard for later viewing. Plus you can download most course materials to your computer to access locally offline. Here’s the real kicker of the critiques: your mentors make corrections in your files showing exactly what they’d do to fix whatever problems you’re facing. This is a huge deal because you’ll watch a professional pick up where you left off. You can watch in real time and see exactly what you did wrong and how you should approach similar projects in the future. Note that there are no extra charges for critique videos so you get those pre-packaged with your course. That makes a big difference in your learning and your wallet. With this type of digital classroom you’ll work through each lesson on your own but can always contact your mentor any time. The critiques work like Q&As where you discuss problems, questions, or confusing points so your mentor can correct them. Then you go back over your working files and re-do them based on what you learned, asking any other questions you may have as you go. CG Spectrum comes with a messaging system so you can send questions directly to your mentor at any time day or night. Usually you’ll get a response within a day. This is one of the best systems for working closely with your instructor via the Internet. Very few online schools offer this type of education and the personal learning experience is perhaps the best thing you’ll get with CG Spectrum. Once you log into your account you’ll find a very simple dashboard with all the courses you’ve enrolled with. The course library page includes a small percentage with each course based on how many exercises you’ve completed so far. This can be helpful if you’re not sure where to pick up or which lesson(s) you may need to go back and review. In the sidebar you have quick links for accessing live session videos and messaging. From here you can send new messages or check your inbox for important updates. Now the actual course pages themselves are kinda messy. I’ve certainly seen cleaner dashboards on other learning sites. But CG Spectrum’s dashboard is certainly usable, it just takes some getting used to. On the main course page you’ll see a list of all topics covered in that course organized by week. The full diploma courses have more of a strict weekly structure compared to the one-off single trimester courses(those run about 16 weeks long). Here are two sample previews from the two main concept art courses, one for the 4-month course and the other for the year-long diploma. You’ll notice the diploma course breaks into trimesters where you’ll have “study periods” ranging from 12-16 weeks. This makes it a lot easier to consume the content and it makes your learning experience feel a lot more like traditional schooling. 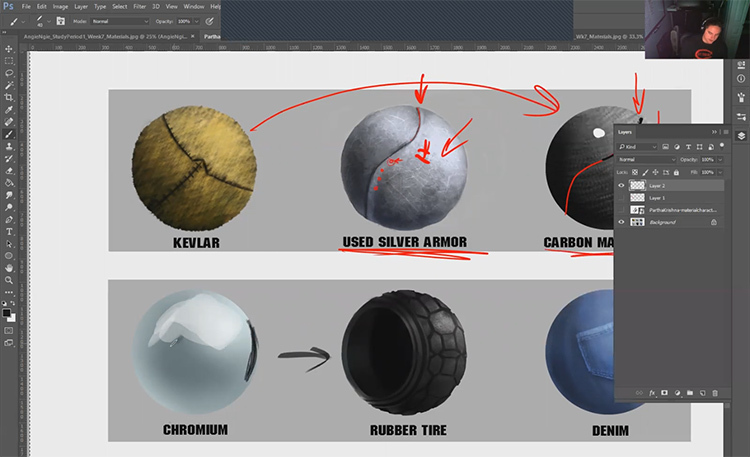 Granted the materials are just as challenging so you do need to treat this like schooling! But online access to past lessons makes it a lot easier to work through. For the video pages they’re also pretty simple. When you click on a lesson you’ll get an overview of what you’ll learn in that lesson along with very specific instructions. Some weekly lessons have multiple videos and those are marked with tabs on the video page. Underneath the video you’ll find submission requirements detailing what you need to submit and which formats(eg. PSD and JPEG files). The videos range from 10-30 minutes with some being a bit shorter and others being much longer. All video content is hosted privately through Vimeo so they stream pretty quickly. You can also pick between HD and SD video quality from 720p HD down to 360p SD. Now here’s one thing I don’t like about the video pages: the awkward navigation. All the top nav links change on video pages so you can’t get directly back to the dashboard. You have to click the “exit” link in the top-right corner to close and go back to the courses list. Personally I find this confusing and not super intuitive. But once you get used to the interface it’s no big deal. Some lessons aren’t recorded live but most are. The quality doesn’t change much either way but it is great to have a live instructor teaching in real time. One thing I like about the live videos is how interactive they feel. You’ll be learning alongside other students and if you do a group critique you can learn from their mistakes too. But private critique videos are absurdly awesome. Every mentor teaching at CG Spectrum has some practical industry experience. 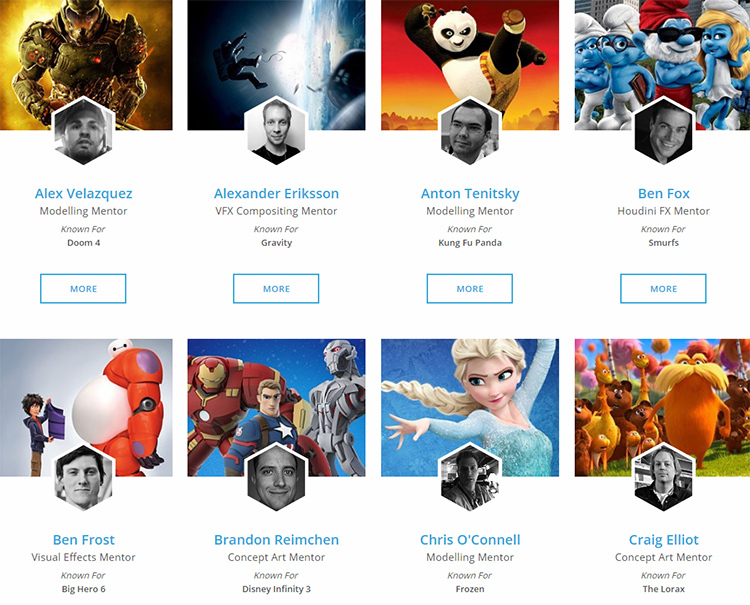 These mentors include artists who worked on major movies like Frozen, The Incredibles, Superman v Batman, and How To Train Your Dragon. You’ll also find just as many mentors with major game experience like Assassin’s Creed and Doom 4. You can see a full list of mentors on the site where you can check out their credentials. And this should give you some faith in their critique quality. The critique videos work like a breakdown session going over all your mistakes and certain areas with room for improvement. You’ll often get critique videos with your mentors redlining your efforts and covering exactly what you did wrong(or could do better). Live sessions can range from 10-15 minutes or upwards of a full hour(or more) depending on the topic. This means you’ll see a lot of variation week-to-week depending on how many critique videos you take and how long your class videos run. Each class video includes a small capture of the instructor’s work space so you can see their face and what they’re doing on the computer. Pretty cool! The one-on-one critique videos are where you’ll learn the most. These are where you can ask very technical questions and get immediate feedback from your mentors. If you can afford a diploma course or any of the 1-on-1 individual courses I definitely recommend getting the VIP treatment. There’s no replacement to watching an industry professional fix your work and tell you which areas need improvement, how to improve them, and how you might solve similar problems on the job. Most students gravitate towards Slack because it’s super easy to use. The internal CG Spectrum forum is great but it’s slowly being retired. 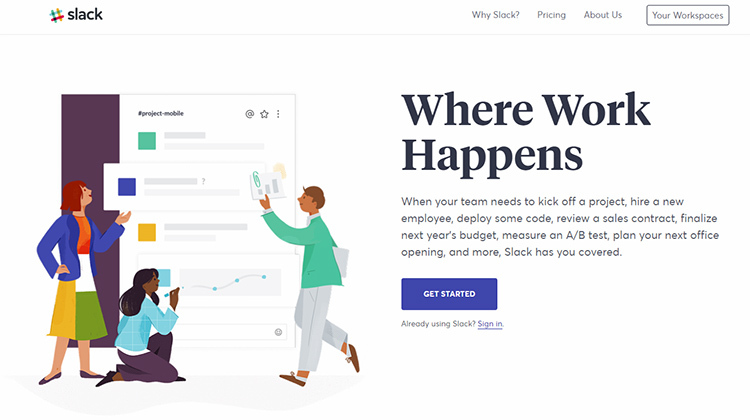 Slack is much better for sharing files and it’s better for creating many sub-discussion areas. Facebook can be a little messy for chatting and sharing files, although it is still active. But with these discussion areas you can gather ideas from other classmates and share problems you’re facing from the coursework. Getting feedback is crucial for learning faster. If you have other people to bounce ideas off you’ll figure out what you’re doing wrong and learn as you go. Plus with these discussion channels you can always get contact details like emails or Skype IDs to do private Skype calls(or even group calls). The community is a huge part of CG Spectrum but it’s also what you make of it. You’ll need to try to be social and connect with people in your class. Ask questions, share answers, connect with other classmates and create your own discussion groups. It may seem awkward at first but really this is a powerful tool for sharing knowledge and building your network of artists. CG Spectrum’s pricing varies greatly depending on the type of course you want. The smaller courses are naturally cheaper and they typically run for 16 weeks(or 4 months). These are intro level courses so they work great for semi-beginners who want to advance their skills in one specific area. The full diploma courses run for a whole year and you’ll be working hard every single week. These diploma courses average 10-30 hours/week in workload and you should probably put in more hours if you wanna see serious improvements. If you opt towards a diploma course you’ll want to make enough time every week to really practice & dedicate yourself for the whole year. It’s a big commitment. Yes this is pricey. Yes it’s fair to say many artists won’t be able to afford these courses. That’s why I strongly recommend building your fundamental skills first. CG Spectrum should be the resource to help you move from a hobbyist to a professional with enough skills to build a quality portfolio. And their pricing reflects that. These prices were taken from the Concept Art diploma course and may vary based on the course you pick. As you can tell, the average fee for most diploma courses will reach into 5-figures. The cheapest you can do for a diploma course is around $7,800 and you’d need to pay that sum upfront. This is why aspiring students may find it easier to enroll in the four-month courses first. You can enroll in those for only $3,000 and you’ll still get professional critiques & instruction from industry veterans. Either way CG Spectrum is not cheap. At least not compared to other online art courses. But it’s offering something you really can’t find at other online learning sites. It’s really an investment into your education and it’s still cheaper than most art colleges. Even FZD School of Design can cost over $40k for just one year of schooling. Granted FZD is a college-style concept art school so it’s a little different than studying online. But if you can swing the price for CG Spectrum it may be worth joining. You just have to make sure they offer a course you’re interested in taking, and make sure you get the most out of your time with them. Who Is CG Spectrum For? I do not think CG Spectrum is for everyone aspiring towards the entertainment industry. For one thing, this school is not a beginner’s learning resource. 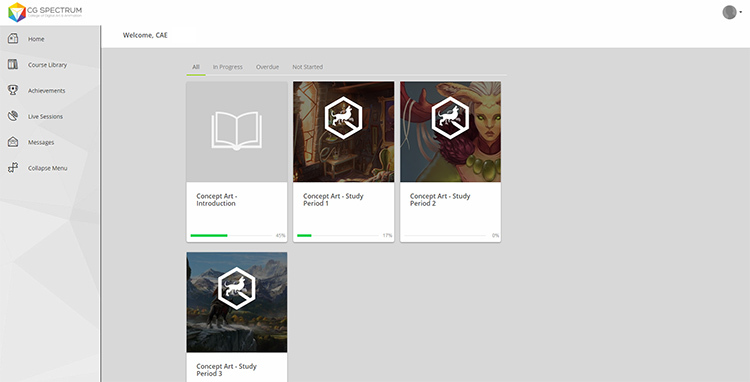 You really need to have the fundamentals down before you dive into these courses(speaking primarily about the concept art course that I demo’d). In that course you’ll learn about Photoshop, digital painting, creating concept designs and coloring them from scratch. 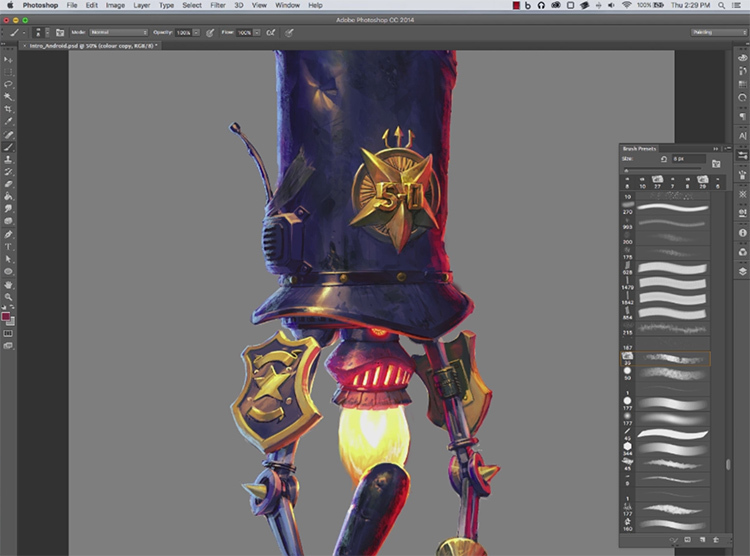 But you really need to feel comfortable with drawing, perspective, light, color, and ideally a tiny bit of Photoshop. I can’t say if this is true for every course. Many courses delve into other areas like 3D animation or 3D modeling and those might be more friendly to novices. But it always helps if you already have some skills in the area so you can move through lessons quicker and get into more advanced Q&As with your mentor. I think CG Spectrum is best suited for anyone who’s not a complete beginner in their chosen field, but not a professional either(although aspiring to become one). Also remember that CG Spectrum is not primarily a 2D art school. They have a diploma course on concept art/illustration and they have the shorter Intro to Concept Art course. But these are the only options for 2D. You’ll find courses on all the major industry software including Maya, Unreal/Unity, Houdini, ZBrush and Photoshop(among other programs). 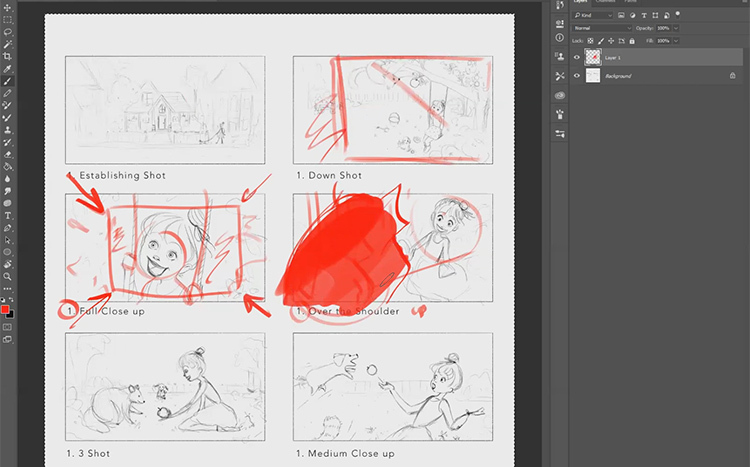 I do not recommend CG Spectrum for anyone studying 2D animation, traditional storyboarding, background painting, character design, or very specific types of concept art. But if you want to pick up a well-rounded approach to concept art & CG art with the goal of landing a job working on games & movies then CG Spectrum is the best online education you can get. If you’re serious about breaking into the entertainment industry then the best way to learn is from a mentor. If you can’t find a personal mentor who’ll teach you for free then CG Spectrum’s professional critiques are the next best thing. CG Spectrum’s mentor list is huge and it’s got to be the largest online school with the highest quality of instruction on entertainment art. Every mentor has worked on at least one major movie franchise or video game title(or both) with huge studios like Pixar, Disney, and Ubisoft. These are the kinds of people qualified to be teaching concept art, modeling, rigging, and 3D animation. This is the type of education you’ll want if you plan to make the entertainment industry your career. I only have two caveats: make sure you’re not a complete beginner and make sure you can clear the time in your schedule for 10-30 hours of work per week. You have to treat CG Spectrum almost like a fulltime job to really get the most value for your money. And with CG Spectrum’s pricey enrollment fees you’ll want to stretch your dollar as far as you can. Overall I’m beyond impressed with CG Spectrum’s teaching style. If your skills are between beginner and intermediate, or pushing into advanced, you should be able to follow any of the diploma courses and walk away with a massive wealth of practical knowledge. Visit CG Spectrum’s website to learn more about what they offer and the date for their next enrollment period. Also be sure to have a peek at their courses too. Look for courses that can push your current skills higher and help you craft a kickass portfolio for a long-lasting career in movies & video games.